Reanalyses find rising humidity in the Arctic | Watts Up With That? Direct, reliable observations of atmospheric conditions stretch as far back as the mid seventeenth century, with otherwise consistent records being punctuated by periodic updates in methods, practitioners, and observational equipment. To bridge these shifts in technique and technology, scientists develop reanalysis models designed to tie together diverse observations into a coherent picture of the system’s evolution. But, like all models or analytical techniques, reanalysis data sets can suffer from errors or biases. Identifying how the records produced by different reanalyses vary can be a difficult practice, but determining if a cluster of models consistently produces biased results can be even more difficult. A number of reanalyses have recently been developed to track the rapidly changing Arctic atmosphere, and Serreze et al. compared them with one another and with the observational record. The authors focused on how the reanalyses represent the change in Arctic tropospheric water vapor from 1979 to 2010. They compared three of the most recent and complex reanalyses against meteorological measurements made using radiosondes at nine sites north of 70 degrees North. They find that the reanalyses consistently overestimate low-altitude temperatures and winter humidity. It is important to note that these positive biases caused the reanalyses to miss low-altitude wintertime temperature and humidity inversions identified by the radiosondes. A finding shared by both reanalyses and radiosonde observations, however, is of an increasing availability of precipitable water in the low-altitude Arctic, which the authors suggest is associated with increasing air-sea surface temperatures, reduced sea ice extent, and other markers consistent with the polar amplification of global warming. Increasing Arctic humidity is a troubling result, as heightening atmospheric water vapor could further drive up regional temperatures. Changes in tropospheric water vapor over the Arctic are examined for the period 1979 to 2010 using humidity and temperature data from nine high latitude radiosonde stations north of 70°N with nearly complete records, and from six atmospheric reanalyses, emphasizing the three most modern efforts, MERRA, CFSR and ERA-Interim. Based on comparisons with the radiosonde profiles, the reanalyses as a group have positive cold-season humidity and temperature biases below the 850 hPa level and consequently do not capture observed low-level humidity and temperature inversions. MERRA has the smallest biases. Trends in column-integrated (surface to 500 hPa) water vapor (precipitable water) computed using data from the radiosondes and from the three modern reanalyses at the radiosonde locations are mostly positive, but magnitudes and statistical significance vary widely between sites and seasons. 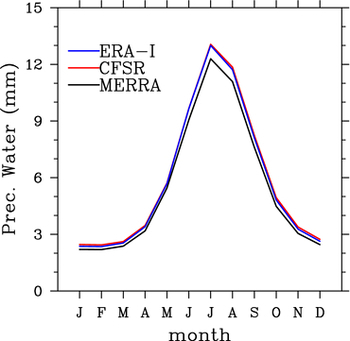 Positive trends in precipitable water from MERRA, CFSR and ERA-Interim, largest in summer and early autumn, dominate the northern North Atlantic, including the Greenland, Norwegian and Barents seas, the Canadian Arctic Archipelago and (on the Pacific side) the Beaufort and Chukchi seas. This pattern is linked to positive anomalies in air and sea surface temperature and negative anomalies in end-of-summer sea ice extent. Trends from ERA-Interim are weaker than those from either MERRA or CFSR. As assessed for polar cap averages (the region north of 70°N), MERRA, CFSR and ERA-Interim all show increasing surface-500 hPa precipitable over the analysis period encompassing most months, consistent with increases in 850 hPa air temperature and 850 hPa specific humidity. Data from all of the reanalyses point to strong interannual and decadal variability. The MERRA record in particular shows evidence of artifacts likely introduced by changes in assimilation data streams. A focus on the most recent decade (2001–2010) reveals large differences between the three reanalyses in the vertical structure of specific humidity and temperature anomalies. So what? Submarines surfaced at the north pole decades ago. Since when is “troubling” an appropriate scientific descriptor? Oh, it’s our buddy Mark “death spiral” Serreze. I had mistaken this for a serious journal article by a credible, dispassionate researcher not a pathetic political attention whore. I’ll have to pre-screen for his name from now on. On the bright side, all that humidity could deposit more snow on the land masses such as Greenland in a mechanism not unlike lake effect snow. On the depressing side, has anyone noticed this? There’s way too much ice exiting the Fram strait and the concentration around the Queen Elizabeth Islands is at unheard of lows for June. The absence of solid white is downright creepy. 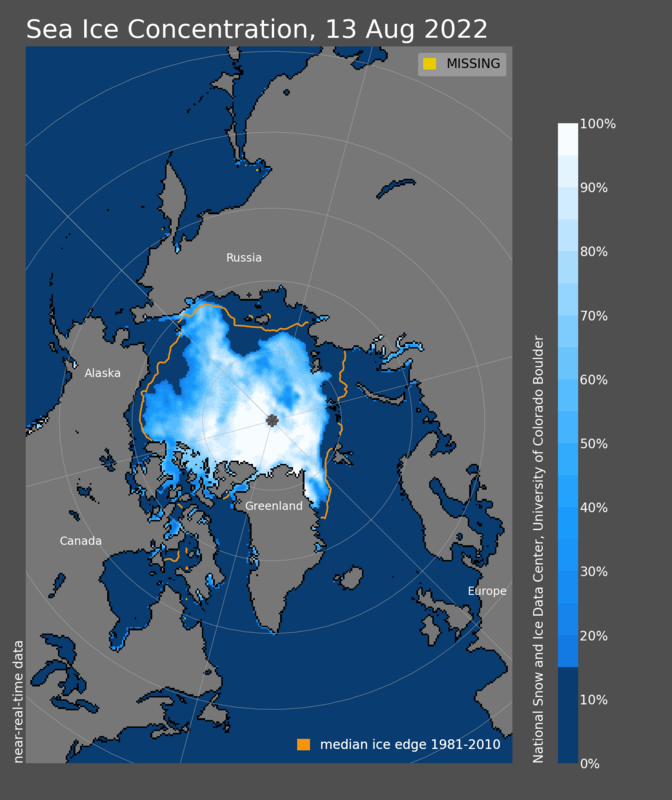 The record low sea ice extent could be shattered this year. But isn’t decreased humidity around Kilimanjaro associated with loss of ice? “a cluster of models “………. no, it’s a cluster something, but a cluster of models? What’s that? Analogous to a gaggle? What’s does this tell us? That models are wrong? No doubt, thanks for cluing us in on that NOAA. Brilliant deductive work! Or that warmer conditions may be associated with higher humidity over bodies of water? Julienne or Mark, what’s the take away from this? It sure was! But, now the ice is back….. so maybe the humidity increased and they didn’t tell us? Or maybe they were FOS? Hard telling……. Serreze et al. are evidently discovering what Marcel Leroux has explained for quite a while now namely that the 1970s change to a rapid mode of circulation is sending more powerful polar anticyclone -colder air, high pressure- deeper into the tropics and as a result is renewing advection of warmer, moist air toward the Arctic explaining both the increase in moisture in the Arctic and the melting of Greenland east coast. I invite readers to enjoy “Dynamic Analysis of Weather and Climate”, Springer 2010 2nd English Edition. So when Serreze et al. claim “polar amplification of global warming” and that it is “troubling”, it sadly demonstrates their utter lack of understanding of the dynamics of atmospheric circulation and how their ideological blinders prevent them to see the light. 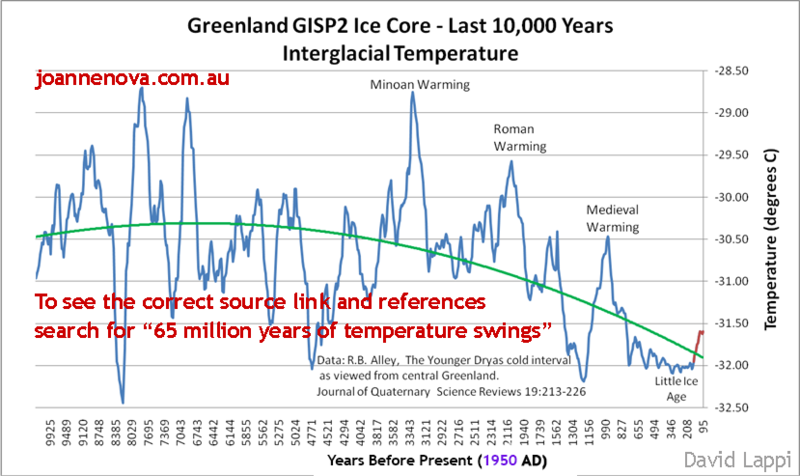 Furthermore, this dynamic is not reflected in the favored AGWists use of temperature averages over the Arctic as some areas are cooling while others are warming as a consequence of the dynamic. Global warming has from the beginning been about the throwing off of morality and a means to an end. It explains everything: it’s all about liberal fascism. What about the talk about enthalpy, total heat content, how it makes the idea of a “global average temperature” worthless as 100°F dry air can have the same heat content as 70°F moist air so averaging the bare temperatures together tells you nothing about the actual heat energy, which should be the important metric? If the Arctic humidity is rising while the Arctic temperatures are rising several times faster than the rest of the globe in line with the modeled predictions of polar amplification, doesn’t that mean there’s a whole lot more heat energy in the Arctic now than in the past, perhaps exceeding what the modeled CAGW predictions said there’d be? My understanding being that NASA’s own studies show that on a global basis water vapour has declined… this would be (supposing that is that their results are accurate) a regional effect only. How a regional effect in opposition to the global trend can be construed as “polar amplification” of a global trend is beyond me. Not to mention that the notion that colder is better is just…. words fail me. How about dumber than a bag of ice cubes for sale in the arctic. To polar bears. Who are sitting on ice flows. A finding shared by both reanalyses and radiosonde observations, however, is of an increasing availability of precipitable water in the low-altitude Arctic, which the authors suggest is associated with increasing air-sea surface temperatures, reduced sea ice extent, and other markers consistent with the polar amplification of global warming. Increasing precipitable water vapor is almost irrelevant to the greenhouse effect. Precipitable water vapor is the total column amount of water vapor in the atmosphere. But an absolute change of humidity in the upper atmosphere at 300 mb to 400 mb pressure level has 30 times the effect on the outgoing longwave radiation as the same change near the surface, as determined by line-by-line radiative code computer simulations. It matters where in the vertical column the water vapor changes, not the total column amount. for uniform warming, the largest fractional change in water vapour, and thus the largest contribution to the feedback, occurs in the upper troposphere. Polar amplification of global warming is not caused by increasing water vapour. The specific humidity trend at 300 mbars from 1979 to 2011 of the NOAA radiosonde dataset shows a 11.6% decline. This means that the increase in Arctic temperatures could not have been caused by anthropogenic greenhouse gas emissions. The odd patterns of weather that bring the air from the Arctic down to North America and Europe would thus hold more moisture. This does not auger well for the AGW crowd as some severe white global warming may be a problem in the coming winters. They do tend to have trouble seeing the forest with all the trees in the way. Mark C. Serreze, as in “Arctic Death Spiral” Serreze? Pinch of salt. Interesting. I’ll read the links shortly. You’re thinking geese; you want crows. A murder of models. I can exactly tell you what winters had more humidity in the Arctic. Tell me if I’m wrong. This is all because of the jet stream. Ofcourse if you tell me that CO2 changes the jet stream than CO2 is the problem. But what I see is Global Cooling. In an ever-changing world, things are getting ever-worse. Not different, never better, only “troubling” or some other modifier that implies a threat. Only more money will fix the problem. Just like it always has…. “A finding shared by both reanalyses and radiosonde observations, however, is of an increasing availability of [Polar Bear Populations] in the low-altitude Arctic, which the authors suggest is associated with increasing air-sea surface temperatures, reduced sea ice extent, and other markers consistent with the Polar [Bear] amplification of global warming. Increasing Arctic [Polar Bear populations] is a troubling result, as [more Polar Bears] could further drive up regional temperatures. Our computer analyses never get the same result twice..
Error bars? Sorry, I forgot, this is climate science. They’re optional. Frederick beat me to it, except I’m rooting for global warming while expecting the opposite. Whenever I see something used reanalysis data I get out a big grain of salt to take the results with. It is very uncertain what biases may exist in them or how reliable they may be. Nevertheless it doesn’t seem unreasonable to think that there may be some increase in humidity in parts of the atmosphere if temperatures go up. By itself, that would amplify warming as a “positive feedback”-but it is hardly the end of the story. Depending on how clouds and their properties change any positive feedback from water vapor can easily be canceled. And if one is going to analyze the feedback processes at work, focusing on a narrow domain like the Arctic rather than the whole Earth can mislead you. Better to look everywhere at once. People that have carefully done this have tended to find little evidence that the total feedback is positive, indeed, the evidence points more toward negative total feedback. Humidity is a weather thing. I’ld be looking at Arctic pressure systems and oscillation over this same time period. My bet is that humidity is a function of the types of weather patterns that have predominated during this time period, not some wriggle matching between CO2 and humidity. Weather systems beat the heck out of teeny, tiny increases in human-sourced CO2. Weather systems are so powerful they not only cause a blocking high, they can eventually sweep one away. Try to get CO2 to do that. Oh, my bad. Gore could. He has lots and lots of CO2. I have two further thoughts on this. First, it is a breath of fresh air to find that the “reanalysis” runs did not match the raw un-reanalysed (read unhomogenized and unadjusted) observations very well and they admitted it (kind of). Second, I smell a fudge, or at least a dodge. What is the difference between “availability of precipitable water” and “humidity”? They seem to be saying that the “increasing availability of precipitable water in the low-altitude Arctic” could result in increasing “troubling” Arctic humidity. I would like to check the raw data for the actual humidity measures. In this day and age of changed meanings, could they be doing the same trick that the marine gal did (suggesting increasing acidity from the change in hydrogen ion concentration)? What metric did they use to measure “increasing availability of precipitable water”? And did they then extrapolate that to say “increasing Arctic humidity”? Key points? Not even close to the abstract. So is this also post normal science? Now even the ABSTRACT can say something different than the key-points press release? This whole thing looks like an attempt to get a study that demonstrated no significant findings into publication and spin it so that it would be reported that it did find such significant results. And it wasn’t the mass media that did it, it looks like the people at the National Snow and Ice Data Center, Cooperative Institute for Research in Environmental Sciences, University of Colorado in Boulder did that spin themselves. This is rather bold-faced, no apologies lying in my opinion. Higher humidity in the arctic – higher snowfall and build up of glaciers in Greenland. That’s my theory of the next glaciation. When the Arctic Ocean is open all year we will have ocean-effect snow all round the perimeter of the Arctic every day of the year. Think of the accumulation in winter! Everywhere around the Arctic would be like Buffalo in a bad year (well, maybe not that bad). (1) The models are lyin.’ (2) The models are based as much on hubris as science. The Arctic ocean cannot be open all year. The tilt of our Earth and the current set of land masses keeping the oceanic circulation patterns in their course will keep the freeze-melt cycle going. You would have to change something in the physics maths, something really big, in order to get a year round ice free Arctic. Watervapour is a powerful greenhouse gas. Could the increase in watervapour be the cause of rapid warming of the Arctic? Or am I mixing up cause and effect? Warning! Warning! Warning! Obfuscation in progress! Let’s see, from their graph it looks like they’ve managed to squeeze an extra mm of precipitable water at the peak modeled difference using their ‘new’ models. Just wait till they finish their newer longer wider wetter models next year! The way the models perform I don’t see much to be proud of yet. My simple understanding is that humid air takes much more energy to heat than dry air. Compare the tropics to deserts. An increase in humidity in the arctic would seem, to me, an inhibiting factor to a rise in temperature. Although water vapour is our most abundant greenhouse gas, to have a warming effect, wouldn’t it have to be much higher in the atmosphere? increasing availability of precipitable water in the low-altitude Arctic, which the authors suggest is associated with increasing air-sea surface temperatures, reduced sea ice extent, and other markers consistent with the polar amplification of global warming. Increased water vapour is also consistent with black carbon deposition and increased solar insolation melting ice and allowing increased ocean evaporation. I’d add that albedo changes from snow/sea ice to open ocean will be much larger than any water vapour GHG effect. When sea ice melts the percentage of solar insolation reflected changes from more than 60% to less than 10%. Clearly, melting sea ice causes a strong warming feedback from the albedo change. The limiting factor has to be increased snowfall and snow accumulation on land adjacent to the Arctic causing land surface cooling (from albedo changes again). And indeed we have seen large increases in winter snow cover in the last decade, but curiously large decreases in summer snow cover. Its snowing a lot more in the NH, but snow is melting a lot faster. The faster snow melt will from the same cause as the sea ice melt – BC deposition and increased insolation. At some point cooling from snow albedo changes will exceed the BC/insolation effect. Lets hope this isn’t the trigger for the next glacial phase. Nice to see that many responding here are zeroing in on the Ewing/Donn theory of Ice Ages. Well worth your time to dig into. The colderside webpages may also help! This is a scientific way of saying; “can’t tell anything since numbers are all over the map.” Do all scientists write gobbledegook as good as this stuff ? More water vapor (aka precipitable water; meaning it can snow more to increase albedo) in the amosphere leads to more solar radiation absorbed in the atmosphere, specially in those much longer atmospheric air mass oblique paths in the arctic, and this increased absorption leads to less solar radiant energy being deposited in the arctic oceans and land areas, so it leads to a cooling surface. James, one of the main purposes of the paper was to evaluate the accuracy of the reanalysis, especially the three most recent efforts to see how well they match each other (i.e. how robust their signals are) and how well they match the limited number of in situ observations. Since scientists rely on reanalysis data to give a larger picture in space and time than the rawinsonde data can provide, it’s important to access their accuracy and conclusions based on those data. The second purpose was to evaluate the trends. Results shouldn’t surprise anyone, as the Arctic warms and there’s more transfer of sensible and latent heat to the atmosphere from more open water, you would expect an increase in precipitable water vapor and humidity in the Arctic atmosphere.